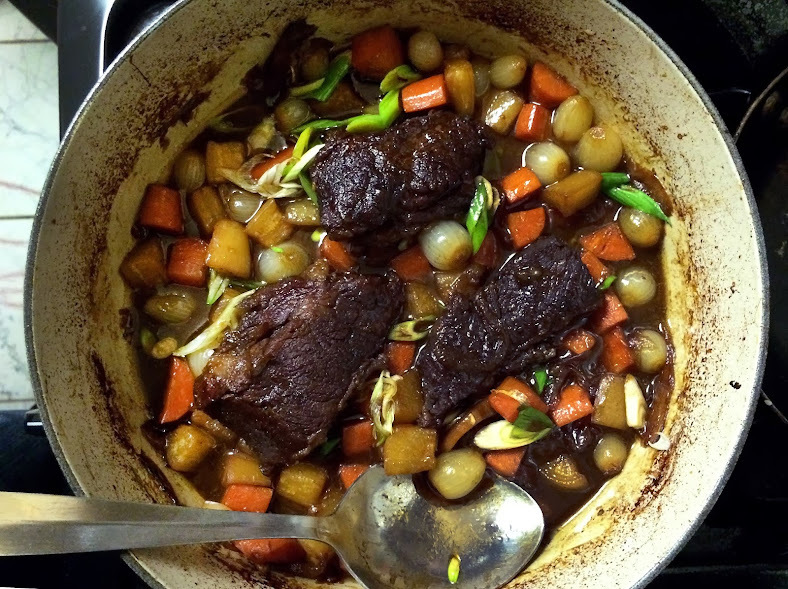 With the chill of winter still in the air, we love a good braised Sunday supper. This recipe is a variation on Chinese style red cooked pork, using boneless beef short ribs. Slow cooking in the oven, this one-pot meal fills the apartment with the aroma of slow simmered beef, cinnamon, anise, and five spice. Buy well marbled short ribs for the best flavor. For a low carb option, omit the carrots and substitute diced pumpkin, red radishes, zucchini, or summer squash. I’ll bet okra would be delicious too. Soy Braised Short Ribs adapted from Martin Yan’s China, Red Cooked Pork. 1. Marinate the short ribs. In a medium bowl, mix the five spice powder, soy sauce and hoisin sauce. Coat the short ribs in the marinade, and leave covered, in the refrigerator for up to 4 hours. 2. To braise the short ribs, pre-heat oven to 350°F. Heat oil in a dutch oven or deep oven proof saucepan over medium-high heat. Pat the short ribs dry, reserving the marinade. Place the short ribs in the pan and them brown on all sides. Remove the short ribs from the pan and set aside. Add the onion, garlic, and ginger to the pan and saute until the onions begin to soften and brown. Add the brown sugar and wine or sherry, scraping up any brown bits from the pan with a wooden spoon. Reduce the wine/sherry until there is just about a tablespoon left. 3. Return the short ribs to the pan, and add the reserved marinade, the star anise, cinnamon stick, chicken stock and chile. Bring the liquid to a boil, cover the pot and transfer to the oven on the middle rack. 4. Cook until the short ribs are tender, about 1-1/2 to 2 hours. When the short ribs are almost ready, add the carrot, daikon, and pearl onion to the pot. Cover and cook 30 minutes more until the vegetables are cooked through. 5. Garnish with freshly chopped scallions and serve. Tags: Asian, Atkins, Beef, Comfort Food, Cooking, Food, Game Day, Low Carb, Short Ribs, Slow Food, Technique. Bookmark the permalink. mmm. that sounds delicious. Have no idea where one could buy short ribs over here, though. You may have to ask the butcher for what you want. Bon Appetit has a good photo and explanation of the three cuts of short ribs here: http://www.bonappetit.com/test-kitchen/cooking-tips/article/beef-short-ribs. American and Dutch primal cuts vary slightly (http://en.wikipedia.org/wiki/Cut_of_beef). 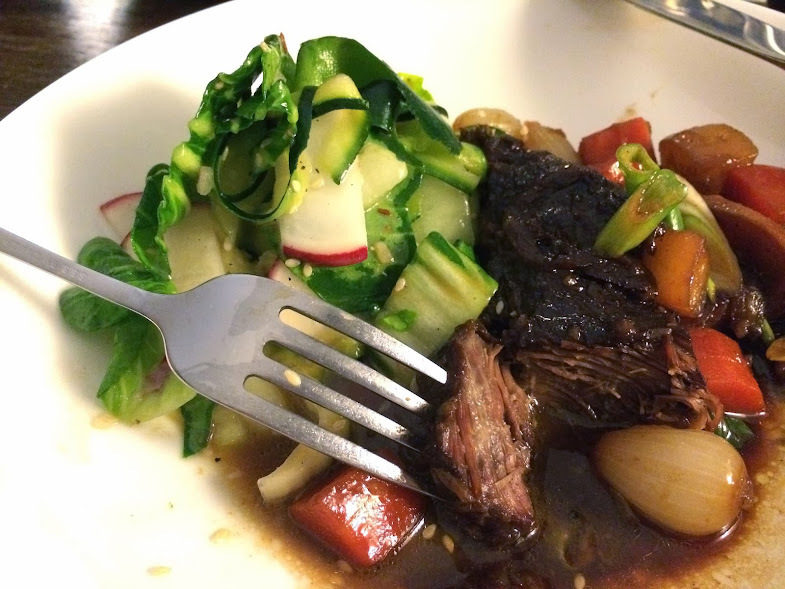 In the U.S. short ribs would be cut from the rib section. In the Netherlands, they will probably cut them from the upper part of what they call the flank. If all else fails, a chuck roast is a good and less expensive substitute. Let me know how it goes!